Less Than 200lbs Payload - Sage Automation Inc. The Sage Automation Light Payload Gantry is applicable for entry level automation tasks such as case palletizing and material handling with lower payloads. This Light Payload Gantry can be built in a series alongside other gantries to function as an assembly line doing various task or built inline doing the same task with a shared infeed trunkline. Depending on product infeed rate this Sage Gantry Robot typically will have 2 to 3 product build locations and can also function as its own pallet and slip sheet dispenser. These can be built as part of a larger warehouse distribution system that can work with Sage Automation Railcars, conveyor lifts, and stretch wrapping systems. Sage Automation can integrate multiple machines into one networked system, regardless of the manufacturer as long as Sage’s equipment can establish I/O communication with the other OEM’s equipment. Sage can streamline your production needs. Sage Automation, Inc. built a system that featured three mini-gantry robots that had sorting conveyors and pallet handling equipment. The Sage Automation Heavy Payload Gantry Robot is applicable for mid-range automation that requires faster speeds and accelerations with more rigidity while carrying heavier payloads. This Heavy Payload Gantry Robot was built as part of a larger factory automation system built to work with existing equipment or with other O.E.M. machinery. Our Heavy Payload Gantry has been used in Pipe Handling, Forge Loading & Unloading, Paper & Tissue, and Synthetic Board Manufacturing Industries. Sage Automation can custom engineer a Heavy Payload Gantry to fit your specific industrial automated material handling and warehouse distribution needs. This Heavy Payload Gantry system was built to process heavy pipe in a manufacturing process. Sage automation systems that have been built in the past have handle loads from 50-60lbs all the way up to 8,000lbs. The pipe entered the system on chain conveyors which was staged into a pick position thru a series of photo eyes. Once it was in position the gantry robot moved to the designated pick position and began the automated handling process. 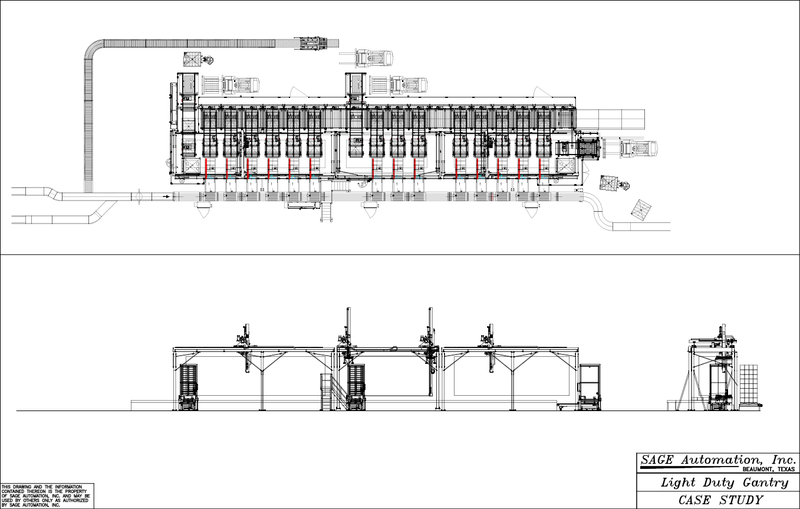 This system utilized two gantry robots that shared a common frame. The gantry robots were synchronized thru the software to operate in tandem. This pipe handling gantry system used a pair of J-hook as its End Of Arm Tools. This Sage Automation Gantry system met all customer requirements and goals. The system increased throughput, increased safety, and has resulted in reduced labor cost allowing for around the clock production. 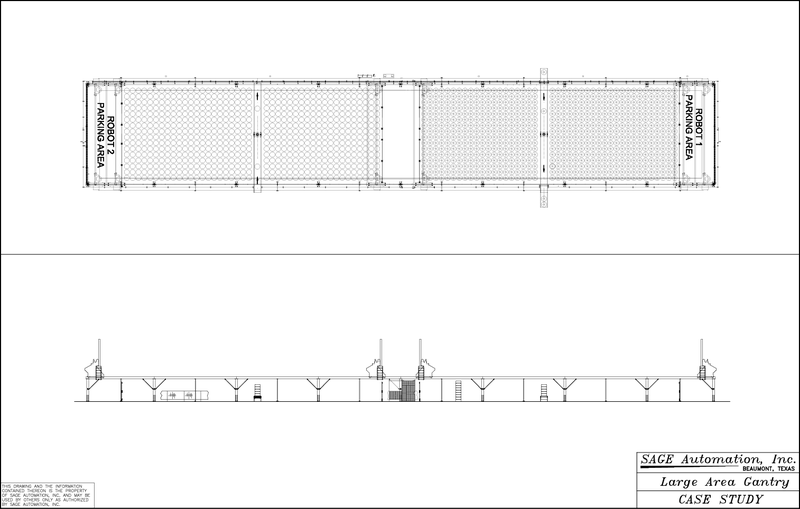 Applicable for large span projects such as Automated Storage and Retrieval systems or other distribution applications. This Tire Warehousing Automated Storage and Retrieval Systems or ASRS consists of two gantry robots that share a common frame, the “X” axis. The main function of this Tire ASRS is to stack and store “raw” tires as well as tire/wheel assemblies until they are requested by the production line. Each Gantry Robot will normally be assigned to its own stack storage block, Robot 1 will serve the tire/wheel assembly stacks and Robot 2 will serve the incoming raw tire stacks. Each stack storage block has a conveyor running thru the stack which is named according to the stack it services. Additionally each robot has its own end effector which picks and places the tires. 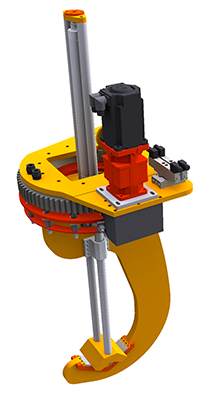 The end effector picks up the tires and tire / wheel assemblies with telescoping clamp arms which allow for various tire sizes. 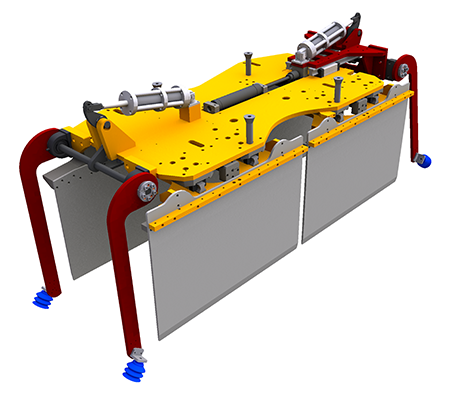 The end effector can pick and place one (1) to five (5) tires or tire / wheel assemblies at a time. The ASRS tracks and archives tire size, quantity, T.W.A. combination and date the tire enters the system. The perimeter and internal barrier fences are also part of the ASRS. The perimeter fencing prevents workers from entering the robot operational envelope and the internal barrier fence helps divide the tire stacks and creates maintenance zones. The two robots are in constant communication with each other to prevent collisions. 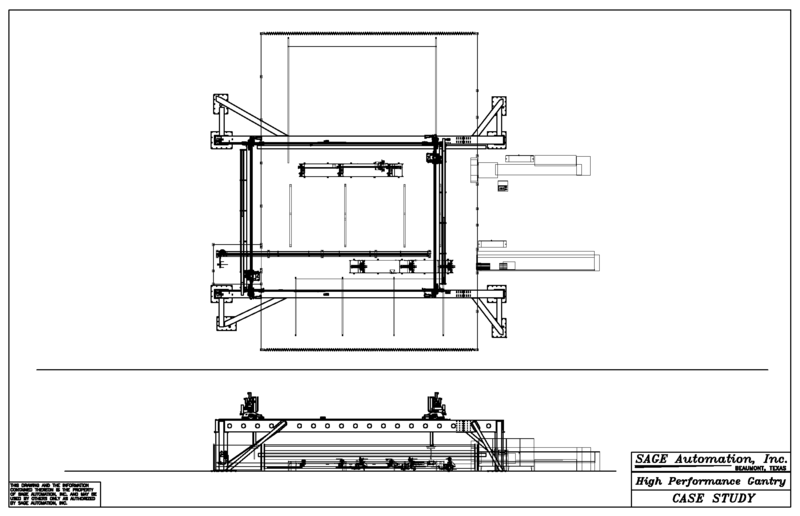 Sage Automation, Inc. proposes an ASRS Large Area Gantry Robot with dual which includes two infeed conveyors and an integrated perimeter fencing system.